The Southeast Coastal Ambassadors are a special group of volunteers that engage the public in the North Carolina Coastal Federation’s work and projects. Ambassadors serve as representatives of the federation at festivals, programs and other outreach events. Benefits of being an ambassador include monthly trainings, special field trips and recognition through T-shirts and name tags. Each month, the federation holds a Coastal Ambassador training that alternates monthly between a day field meeting and an evening program meeting. 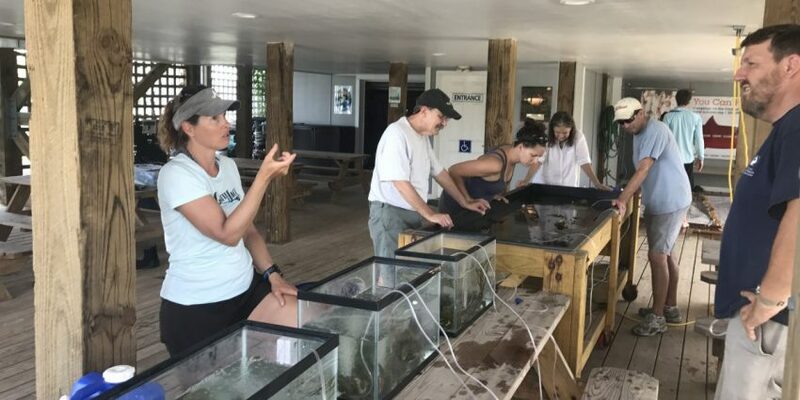 The program is designed to be fun and interactive, allowing volunteers to socialize with one another while learning more about the work of the federation and the coastal environment. Those who wish to become Coastal Ambassadors are required to attend an orientation session held at 5:30 p.m. before the evening program meetings. These take place every other month on the last Tuesday of the month. Ambassadors are required to attend at least five trainings per year and represent the federation at a minimum of three outreach events. This program is for people 16 years or older. Develop a personal elevator speech to engage people on the work of the federation. Greet people and hand out federation publications at events and programs. Direct people to federation staff for questions you are unsure of. Collect emails from people interested in learning more about the federation and volunteer opportunities. Coordinate with the coastal outreach specialist on event details, scheduled shifts and any set up/break down of equipment and materials. Check Google folder and volunteer signup spreadsheet; and sign up for shifts you are able to work for upcoming events. Distribute posters and sell raffle tickets for fundraising events. Once program participants attend the orientation and volunteer at two events they will receive a coastal ambassador T-shirt. To learn more about the Coastal Ambassador program contact Bonnie Mitchell, coastal outreach specialist, at bonniem@nccoast.org or 910-509-2838 ext. 204.